Musa Basjoo is a tough banana species from China and Japan. It is a must have for any hardy tropical grower or anyone wanting a tropical look with low maintenance. This plant grows 10 to 25 feet tall, which makes a enormous statement in any garden. This plant grows 10 to 25 feet tall, which makes a enormous statement in any garden. Plants can reach up to 30 feet tall in idea conditions. It will produce flowers around every 2 to 3 seasons. After a few years in the ground it will form a nice large grove of banana trees. 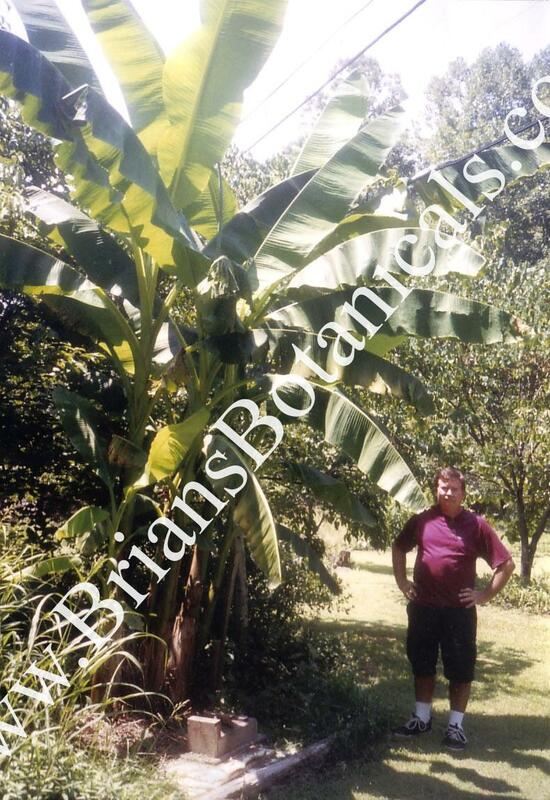 We have grown Musa Basjoo in Louisville, KY for over 12 years in the ground. We suggest cutting the trunks down to around 1 foot tall and mulching over 1 foot with leaves or hard wood mulch. We also recommend growing Colocasia Pink china at the foot of this plant which makes for a very hardy tropical effect. 6-10 One of the hardiest of all Bananas. If mulched can handle extreme cold some good results in zone 5 with good protection.